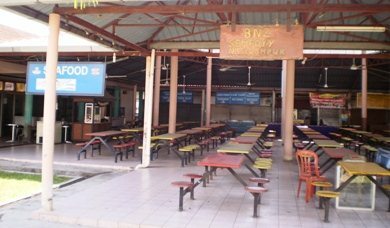 This is not really a restaurant, rather a food stall located in Padang Matsirat very close to the Masjid Padang Matsirat and on the main road. 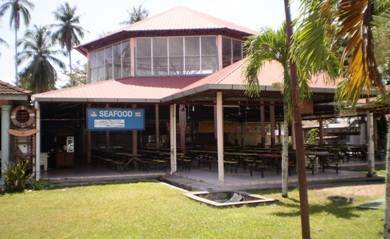 There are several other stalls here that form an al fresco food court offering a casual and relaxed ambience. You ask any local and they will know about this eatery run by husband and wife. So what's so special about this place? It's all about great Malay local food at really cheap price. locals will also know that Nasi Campur which is part of its name, stands for mixed rice. Which means that most of the dishes here are prepared on rice base topped with various kinds of mix that you can choose from like meat, vegetables, seafood, fish, eggs and so on and in different types of preparations. In fact the stall offers large variety of dishes. Come during the lunch time and you will see that the rows of tables in the front common area are full with locals and most of them queuing up at this stall to buy their favorite dish. So what kind of food should you try for. Our favorites here are the ayam masak lemak (chicken with bird's eye chili and coconut gravy), sambal grilled fish and chicken or beef rendang (cooked in coconut milk). But there are some 70 different dishes to choose from. Overall the ambience around is quite nice. From the main road, there is a short paved way that leads to this food complex. On both sides of the paved way are nice green lawns and number of palm & coconut trees giving a green and soothing feeling. And just outside the food complex and at the edge of the road is our favorite Kuih Stall. After having some sumptuous meal at BNZ, come here and try out some local sweets as desserts. It's fabulous and most locals do that. BNZ serves only lunch and is open from 11am until 2:30pm. You will need to buy your food from the stall and then take a seat at one of the many tables in front. The only problem you may face could be with the seats, which are all non-movable small and round seats fixed by a rod to the floor. So it's essentially a 'have a quick lunch' kind of place. It's located very close to the Masjid Padang Matsirat.